There seems to be little known about this species which is native to the Philippines and is a stunning small member of the Vanda family. 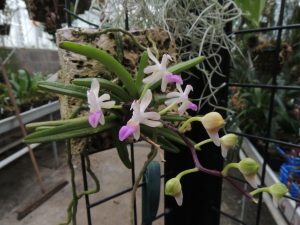 In fact it is quite closely related to yesterday’s Aerides oderata which is over 2m tall while this plant is only about 10cm across. The long lasting flowers look like little birds in flight and are large for the size of the plant. The thick leaves and the fat roots are a good indication that this species comes from a warm dryish forest and so we grow it mounted and hung high in Warm Asia where it thrives.